So I decided to join in in a swap for the first time (wish me luck) called #stitchingsanta from Sewchet. There was a knitting and a sewing section and I entered both of them… Go Me! I just need to work out what to actually make for them now, thankfully both people I got have blogs but post sporadically so I’m not sure these will be truly personalised gifts but hopefully they will be appreciated. So one of the traditions in our house is to still have stockings from Santa and open these in the morning when we get up as we don’t open our presents till after Christmas dinner. A tradition instigated by one of the parents in our family somewhere along the line, to ensure that everyone is around for present opening and someone isn’t taken out by cooking the meal. Since Nikki and I cook the meal now the tradition carries on. 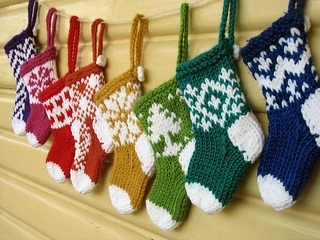 Since I am doing two swaps and 4 stockings I thought I could combine a few of the things and go into mass production. At some point I also need to finish the Advent Calendar from last year! Top L: Seafarers crocheted hat, I know I can make this quite quickly and it is very snuggly, I just need to count carefully… R: Brioche Knit Cowl, I love the texture of brioche knit and want to try this with two varigated yarns Bottom L: Fingerless gloves, I don’t know what pattern yet but I’m thinking of some of these. R: Santa Hat, Because why not! I’ve got to find some sewing related crafts too otherwise that part of my crafting life will feel very left out… And it is normally my dominant craft but come winter I like to snuggle up so knitting comes out in force. Well I’m glad that I’m not the only one that thinks that way. I’m sure stretching the enjoyment had something to do with it when we were younger, now its mostly so that Nikki and I can join in with everyone at present time and get all the cooking done as well! Goodness only knows how much food we will be cooking this year!